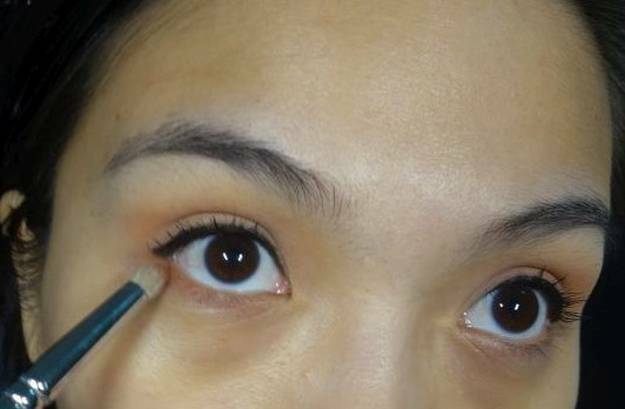 Apply the transition shade over the eye crease. This is the first thing I do whenever I apply eye makeup. I’m using the Zoeva 228 Luxe Crease brush in for applying the transition shade which is the yellowish color. It’s really hard to discuss the shades of the BH Cosmetics eyeshadow palette by Shaaanxo because the shades don’t include names! Apply the matte Brick-red color on the crease lightly for a bit of definition and blend. Here, I used the Zoeva 231 Luxe Petite Crease brush. Apply a liquid liner close to the upper lash line and tight line your eyes for a subtle eye definition. I used two types of eyeliners here. The first one was a pen type eyeliner from Mojolica Majorca. I like this one because it provides precision line with its ultra fine tip. I tight lined with the Eye of Horus Eye Pencil in Smokey Black, to make sure my eyeliner won’t budge. Curl your lashes and apply mascara to open up your eyes. To make sure my eye makeup will pop, I curled and applied a curling mascara. Fill in your brows just enough that it seems fuller but not drawn on. Now, your makeup will never be complete without your brows groomed of course. Frame your eyes with your eyebrows! For this step, I used the K-Palette Real Lasting Eyebrow Pen. This product is one of the most long lasting eyebrow product you can find in the market. I love how it evenly deposits the pigment on my eyebrows without looking over made. Give your eyes depth by applying a light hand of the brick red color on the lower lash line and mascara on the lower lashes. You want to make sure your eye makeup is balanced. You don’t want a heavy top or a heavy bottom. Apply a light to medium coverage foundation all over. For this tutorial, I applied my eye makeup first, using of course, the BH Cosmetics eyeshadow palette, before applying my base makeup. Contour lightly where needed, in my case, I’m only contouring my nose line because I have such a small face that contouring my cheekbones will make me look unhealthy. Apply a natural shade of blush on the apples of your cheeks. I used a combination of a sheer pink and peach blush to give my face dimension. Apply a sheer pink-toned lip color, in this case, the 1st lip shade on the BH Cosmetics Shaaanxo palette. Set with a translucent powder and you’re done. Creating a natural makeup look requires less product with maximum impact for a healthy-looking makeup throughout the day.